We're a take-out restaurant, pizza shop and ice cream parlor all-in-one located just outside OJR High School on Rt. 100 in Pottstown, Chester County. Our food is prepared from scratch and cooked to order in order to provide the best quality food for our patrons. Our menu includes soups, salads, burgers, hoagies, steak sandwiches, hot and cold sandwiches, seafood, pizza, stromboli, milkshakes... and to top it off, 19 flavors of hand-dipped Nelson's Ice Cream. See our menu below or download a copy. We take call ahead orders and during winter months we even bring your order to your car when it's ready. Please be patient during busy times remembering that Good Food is worth the wait! We look forward to serving you! MENU THAT MAKES YOUR EVENT MEMORABLE. ASK FOR LYNN. Will post on Facebook when soups are ready. We can provide GREAT-TASTING food for your next catered event. the restaurant business to develop a menu that will impress your guests and make you the hit of the party. Individual full pans and half pans of any item, as well as party trays are available. Just cause you don't see it on the sample menus, doesn't mean we can't make it so just ask! 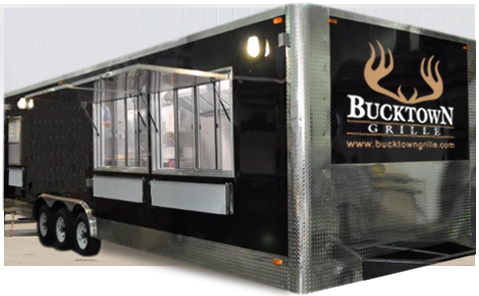 Food truck services also available. Check out our FaceBook page for other comments from our patrons. Download a current copy of our menu. ﻿If you have a suggestion of something you'd like to see added to our menu, or a comment you'd like to make, please feel free to drop us an email. Consuming raw or under cooked food may increase your chances of food borne Illness. Please inform us of any food allergies or dietary restrictions. Small – 8" / Large– 12"
In a hurry? Try our sliders that take less time to cook! All burgers are seasoned and served on kaiser rolls. Burgers take 10-15 minutes to cook depending on how you like them (Medium Rare - Medium - Medium Well - Well). Monster Buck Burgers - Bring Your Appetite! All dressings are served on the side to keep our salads the freshest they can be. We usually carry 2-3 soups during the Fall/Winter months and 1-2 soups during the Spring/Summer. Italian, Ham & Cheese, Cheesesteak, Special Mushroom Cheesesteak, Chicken Cheesesteak, Buffalo Chicken Cheesesteak, Special Mushroom Chicken Cheesesteak, BBQ Chicken, Veggie, or any way you like it using the "Toppings" we have available! Google Maps is inaccurate for our location so we use 2090 Pottstown Pike so you can better locate us. © 2012-2018 Bucktown Grille. All Rights Reserved.